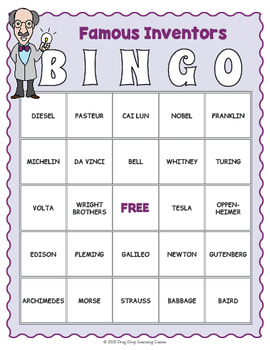 Introduce your students to 25 great inventors and their most famous inventions with this super fun BINGO game. This ever popular game can make a great introduction to just about any subject and is always a welcome fun break in the classroom. 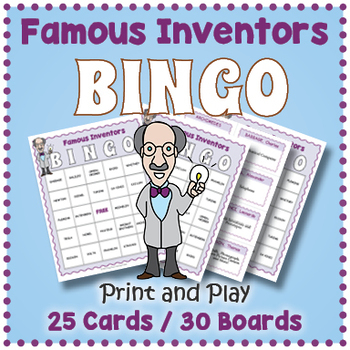 Included are 25 calling cards and 30 unique bingo game boards. 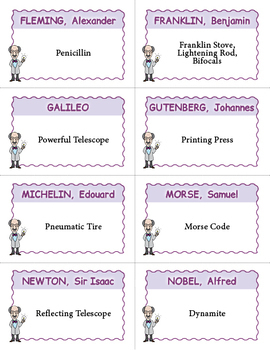 Each calling card has the name of the inventor and what he is most famous for having invented. You can either call out just the accomplishment of the great thinker or include his name, depending on how much you wish to challenge your students. We recommend that you laminate the boards and cards so that you can use them over and over. Equip your independent learning center with this game and kids will have something that is sure to quietly entertain them as they are learning. Bingo can be played with as few as two players and it is a game that is quickly understood by all ages. The cards just by themselves also make an engaging learning resource. Print them twice and you are set to play a memory game. 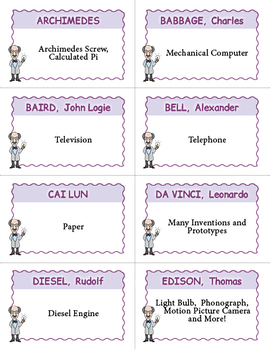 The inventors (along with their inventions) covered are: Archimedes, Babbage, Baird, Bell, Cai Lun, Da Vinci, Diesel, Edison, Fleming, Franklin, Galileo, Gutenberg, Michelin, Morse, Newton, Nobel, Oppenheimer, Pasteur, Strauss, Tesla, Turing, Volta, Watt, Whitney, and the Wright Brothers.